Taichi Rushing and Sudden Agile Fist is an ancient shadowboxing popular in Wen county, Henan province. It features aureole all around the exerciser, so people call it supernatural shadowboxing. 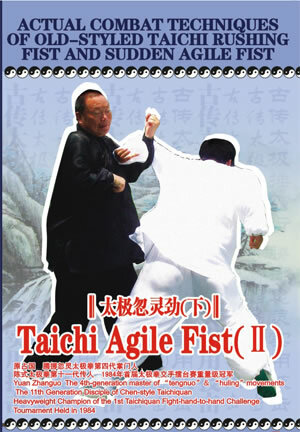 The ancients called the fist routine as Taichi Agile Fist featuring energetic footwork and elusive movement. Each of the movements is circular and then horny, as displays the principle of triangle. According to the lever principle , each movement adheres to the theory of triangle, giving full play to the power. The theory involves three interior triangles and three exterior triangles, at the end of which the acupoint is blocked. Acupoint block is the highest actual combat technique of Taichiquan.